Australia-based technology minerals company, Talga Resources, is actively developing graphene materials and graphene-based applications across many areas, including coatings, batteries, construction materials, composites and more. Mark Thompson, Talga's managing director, was kind enough to update us on Talga's graphene program and answer a few questions we had. Q: Thank you for this interview, Mark. Can you quickly update us on your graphite mine operation in Sweden? Talga has over 20 years of graphite mining potential outlined in economic studies to date and currently extracts intermittently what it needs for scale up and testing purposes. Talga mined approximately 5,000 tonnes of graphite ore during 2015-16 trial mining operations. Further extraction is not required for now but permitting for the future larger scale operations is underway. Q: In September 2016 Talga commissioned the 2nd phase of its pilot test facility in Germany. I understand that the annual processing capacity is 30 tons. Is that now in operation? Will it be possible to expand production if/when required? The Rudolstadt test facility in Germany has been fantastic in upscaling the process to real industrial scale potential and operates single shift 5 days week at present. Under the same conditions an expansion to over 4 times the Phase 2 scale is planned and undergoing design and engineering. Further scale ups in Germany are possible but will be weighed up against when we build much larger processing capacity in Sweden which is the longer term goal. Q: Your graphene materials are flakes (GNPs) produced using exfoliation from graphite. Do you also plan to expand to more graphene material types? (such as GO, or CVD graphene)? 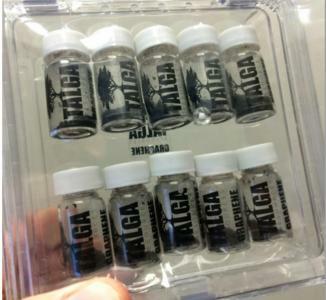 Talga can produce a range of graphene particle morphologies from vFLG to GNP’s to suit the applications, but specifically works in direct production of pristine graphene, not GO, to retain conductivity potential and other properties. To this end we have developed in-house exfoliation, functionalization and dispersion technologies to suit our target additive applications, and leave the oxide routes to others for now. We strive for economic advantages through integrating our carbon source through processing into a product, so at this stage do not pursue CVD or other methods that would not use our 100% owned carbon sources. Q: In July 2015 Talga signed an agreement with Haydale to supply graphene materials. Is that still in place? Yes but developments are in commercial confidence. Remember that as public companies we have to announce material events such as entering contracts, but the individual product developments are often best to be advanced out of the public eye, without providing ideas to wannabe competitors. Both companies have been pretty busy on our own products but there has been some interesting developments that I am confident we can translate to a more active, and ultimately profitable, relationship. Q: Talga is pushing forward with graphene-enhanced battery R&D with flexible battery maker Zinergy, German based Jena Batteries (for flow batteries) and Warwick manufacturing group. Talga announced positive test results for Li-Ion batteries at Warwick. When do you see such batteries entering the market commercially? The anode materials have a lot of test work to be ready for commercial scale use but technically they can fit into current production methodologies and replace synthetic and flake graphite anodes now. There are a lot of drivers for this to happen faster than the past. What kind of impact will graphene have? Incremental at first, then ubiquitous as it will become the new standard required to get the range in EV’s or the lifetime performance or delay the recycling cost of Li-ion batteries. On some emerging battery technologies graphene will be the only way the technology will work at all. Q: What are your views on the graphene battery market? Extremely positive! It is going to be a great part of the Talga growth story and combined with our copper and cobalt assets places us in a highly leveraged position to battery market growth. Q: Any updates from your projects with Zinergy and Jena Batteries? See above regarding commercial confidence, sorry. I will say that batteries share something with our coatings products, in that an anode coating is like a paste or an ink; it is a graphene-rich liquid formula with requirements for adhesion, strength, conductivity and longevity. It may seem like we are ambitious to have so many product developments (and we are!) but many of the products are essentially a similar graphene dispersion with subtle variations of formulation; variations of a theme. This makes it not only feasible but economically advantageous for Talga and accelerates the volume of graphene applications for commercialization. Q: Where do you see Talga in about 3-5 years? In 3-5 years Talga will be transitioning through semi-commercial stages to full scale production and ultimately a global leader in volume and revenue. Q: What will your role be in the graphene market? Our role is to enable a cleaner, more efficient and productive world through lighter, stronger and better performing materials with lower economic impacts. Specifically in the graphene market our role will be at the big volume end, providing graphene additives and products for the largest scale applications. From when you wake up in the morning to when you go to bed, we want almost everything you use to have some graphene in it, making it better. Q: Will you focus on graphene material development or applications? Both. We believe accelerating applications with product development can fasten the demand for materials, and you develop your materials the more you understand the applications. Q: Finally, We'd be very happy to hear your view on the graphene market in 2017, what do you think are the major achievements so far, and what are the main challenges looking forward? I think 2017 will turn out to be an upwards turning point for graphene, when some large “brand-name” companies did more than R & D but started entering more commercial agreements to take graphene into large scale products such as coatings and concrete. The graphene market is shifting from the phase when universities are the main customers to when multi-national conglomerates get more involved. Liquid Crystal Display (LCD) technology took roughly 20 years to commercialize, and it sure became worth a lot, but the pace of commercialization is faster these days due to computer power, modelling, instruments and capital access that didn’t exist then. Since graphene was isolated over 10 years ago, I reckon commercialization is well underway now. The challenges are always many, but there is abundant evidence graphene works in a significant way and it is just a matter of time. Somewhat like the first plastics, there shall be a steady replacement of some current materials with graphene added alternatives. These may not make it into the fancy media headlines, but it will be happening in a factory near you, and soon be in everything from your car to your phone to your clothes. Thank you Mark, for this interesting interview. I wish you and Talga Resources the best of luck!